I've done a little internet research on ice cream makers, and discovered that although users of the Donvier ice cream maker that I have are generally satisfied, the "experts" rate it very low. It's very easy to operate, and if you have the freezer space to store the metal canister, ready at a moment's notice. However, the pricier electric machines apparently make a creamier product. In addition, some machines create a product that stays creamy in the freezer during storage, something that the Donvier does not. Also, you must refreeze the canister for 7 hours if you want to make a second batch. (And, I can tell you for a fact that this is true.) I don't take ice cream making seriously enough to warrant buying a new machine. You can spend $50-$700 on a machine, but I plan to continue using my $5 garage sale Donvier. 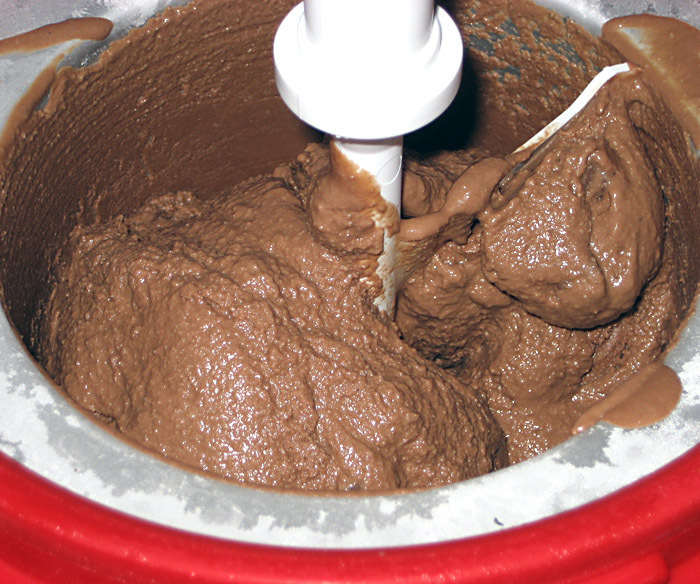 You can read an article about ice cream makers here. 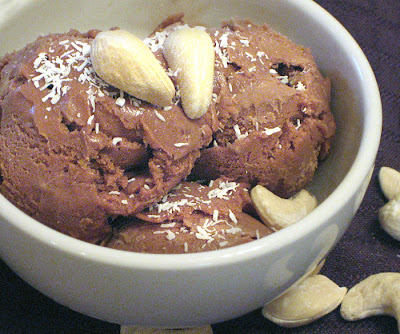 This recipe is dairy and soy free and tastes amazing. It is creamy and smooth and maybe a little too sweet. My husband disagreed with me about the sweetness. He thought it was just like ice cream, and what most people expected from a frozen dessert. I was inspired by a recipe on a cooking video on you tube. Lilla, the ice cream chef, says in the video that you must use a professional blender to achieve the right level of creaminess. (Hers is an enviable Ktec Champ HP3 that costs $400.) But I used my regular KitchenAid with great success. I blended the mixture for several minutes until there was no trace of grainy texture. She also used an interesting ice cream maker that made the ice cream in the freezer. I will also note that Lilla used raw ingredients including something called really raw chocolate. I used natural cocoa powder. (I would share the video but it's no longer available.) By the way, this ice cream did not get icy in the freezer. After several days, it's hard but still smooth and creamy. Soak the cashews in water (in the refrigerator) for four hours or overnight. Blend the first six ingredients in a blender or food processor until extremely smooth and creamy. Blend, blend, blend! Stir in the chocolate chips and chill the mix for an hour or overnight. Freeze in your ice cream freezer. note: My son tried to make this, and while it was delicious, it was a challenge for his blender to get the cashews really blended to a creamy consistency. You might want to do a little test to see if your blender is up to the challenge before making an entire batch. Thanks for the link to the ice cream maker article. I've been thinking about getting an ice cream maker. It looks like I could get an attachment for my stand mixer. Hmm..
Did you see the interesting ice cream maker in the video? It worked by itself in the freezer! Very interesting ice cream recipe. Thanks for sharing this one. This was absolutely fabulous. It was so rich, I think I could have left out the chocolate chips. Granted, mine were 78% cacao so perhaps something lighter wouldn't be so heavy. I didn't trust my blender, so I ended up getting 1 cup of raw cashew butter from Whole Foods bulk section. I think it was less expensive than buying the cashews! Delicious! I'm going to try this with other nut butters as well.